For the one year anniversary of the fifteen year anniversary, I wanted to mark the occasion with something to evoke flavors that would transport us back to that place. About a month after we returned from that trip, I started trying to work out something to that effect. I jotted down a bunch of the flavors that we agreed helped to describe our time there. Coconut. Papaya. Lime. Guava. Pineapple. We couldn’t work them all in — that would be too much, too busy. But perhaps one or two? We crossed off pineapple because you seem to get that “for free” in so many IPAs these days. Plus, pineapple seemed so… prosaic? We eliminated lime for similar reasons. Coconut seemed almost mandatory. It goes so well with those roasty stout flavors, and anyway it was kind of a defining feature of the trip. At that point, it was a toss up between guava and papaya as to which would be the complementary flavor. Both seemed good matches with the coconut, but we had a stronger nostalgic affinity for the papaya. With that decided, I went ahead and tried to build a formulation around those two fruits. 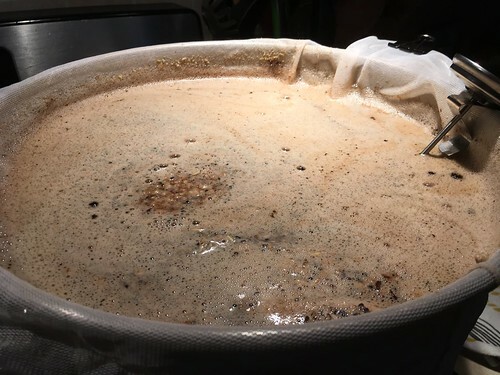 I worked on the recipe for about three months, reading up on the style, looking at what other brewers have done, and trying to think carefully about some key ingredients. I went back and forth on the yeast strain a few times: WLP002 vs. 2112 — ultimately settling on the latter.2 I considered a bunch of different hop combinations, trying to find something that would evoke tropical flavors without clashing with the roasty and chocolatey malts. I evaluated different adjunct sugars, and whether to include them at all. What would be the best grains for gravity and color here? What about the flavor? 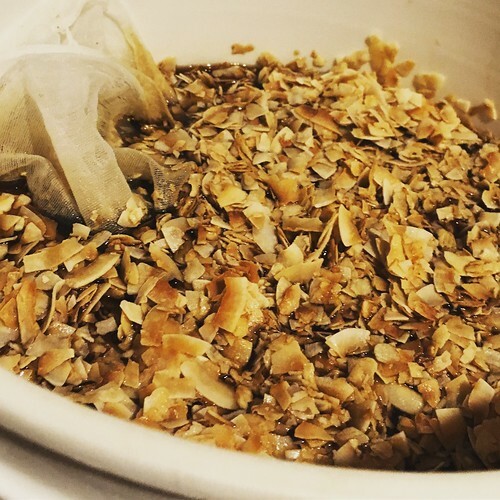 What grains and hops would go well with the coconut? With the papaya? It wasn’t so much that I over-thought it, as I took my time. By the end of December I had the formulation pinned down and I was fussing over details like whether to use shredded coconut or flakes. Come mid-January, I was ready to brew. The night before brew day, I got all my gear lugged upstairs and the water measured out.3 I got the flame going bright and early, and before breakfast I was mashing in. 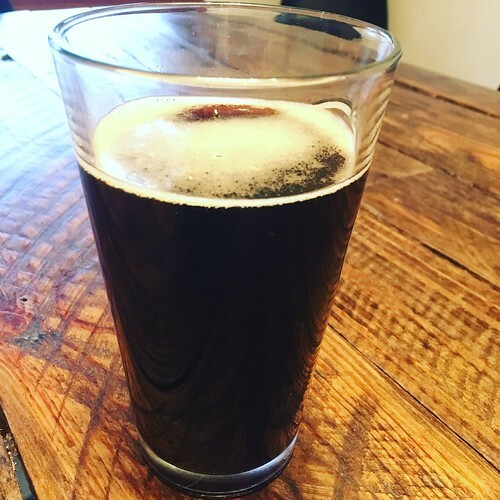 As this was a dark beer, I used a tip from Gordon Strong and added my dark grains as late as possible.4 I skipped any sparge (faux or otherwise) and squeezed the hell out of my brew bag. When I started the heat again for the boil, I had wort that was sitting at 1.074. Normally I add my extracts as late additions, but seeing as how that’s mostly to avoid kettle caramelization and unwanted darkening, I added my three pounds of DME immediately. This brew foamed like crazy, but fortunately it never boiled over. I let it go to town for 90 minutes, adding the hops and the turbinado according to the formulation. 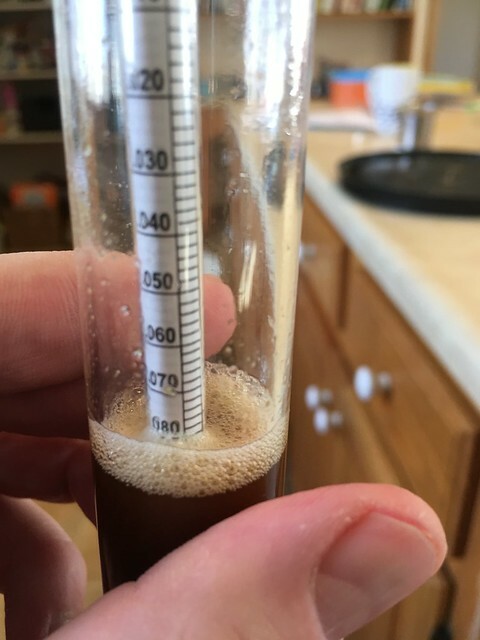 After the boil completed, I did the chill and took a post-boil/pre-top-off gravity reading: 1.167! I transferred this to the carboy (which had 2.5 gallons of top-off water waiting for it). After the transfer, I had to give myself a grin and a pat on the back. I’d nailed it! Five gallons at 1.078. I gave the carboy the best aerating shake that I could, and then pitched the starter of 2112. I fermented the beer in the low 60s (°F) — which seems to be the sweet spot for the 2112 strain. It performed like a champ, giving me solid airlock activity within four hours and a significant start to its krausen cap within 19. A week after pitching, things were dying down in the airlock, and the gravity had dropped to 1.020. BeerSmith had estimated that it would finish at 1.019, so I knew I was close. Just the same, I added yeast energizer and activated a recently acquired FermWrap, ramping up the temperature controller to 68°F. I gave it a few more days and then it did indeed stop at 1.019. Happy with that, it was time to get the fruit. First things first, I racked the beer off of the yeast cake, out of the carboy and into a bucket fermentor. 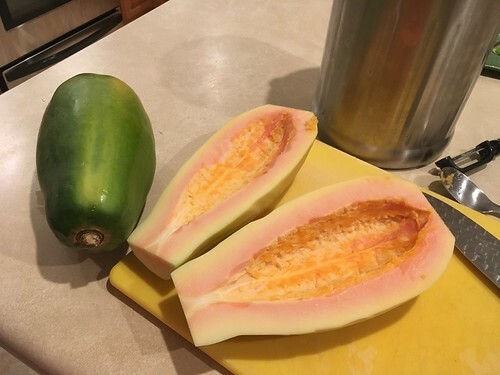 Second, I got my five pounds of papaya. I peeled it, deseeded it, and chopped it up. I stuck it in a big ol’ Ziploc bag and stuck it in the freezer. 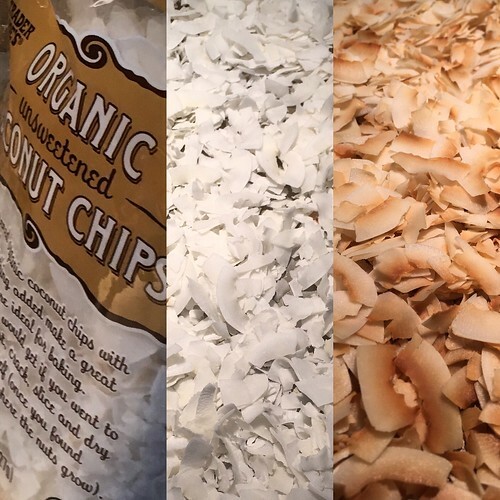 After that, I bought the two pounds of coconut chips that I would need. These I roasted myself and then set aside until I was ready to put everything into the bucket with the beer. A few days and some bottling-day calculations later, I was ready for the penultimate phase. I bagged my dry hops and my papaya, and submerged those. Then I dumped the coconut flakes on top. I gently mixed it all in with my (sanitized!) stainless steel spoon and… let it rest for a week. Nevertheless, the bottles went into the closet to finish their conditioning for carbonation. That night, the anticipation already killing me, I had to content myself with a 10 oz. uncarbonated sample — complete with errant coconut flakes. This did not ease my anticipation. If I were to make this one again, I’d do a better job of accounting for the losses — especially with respect to how much was absorbed by the fruit, and how much that same fruit clogged the siphon. Overall, I’m happy with the ingredients (especially those that went into the kettle) and the technique used for handling them. If I changed anything, it would be the most minor of tweaks. There’s a lot of delicate flavors to balance in here and even small adjustments could throw it off. In the meantime, I’ve got to set two aside to cellar for our anniversary this summer, a couple more for competition, and one more for a friend that made me promise she could have one. Otherwise, these are likely to go fast. Shared a couple bottles with my friends down at one of the local breweries. 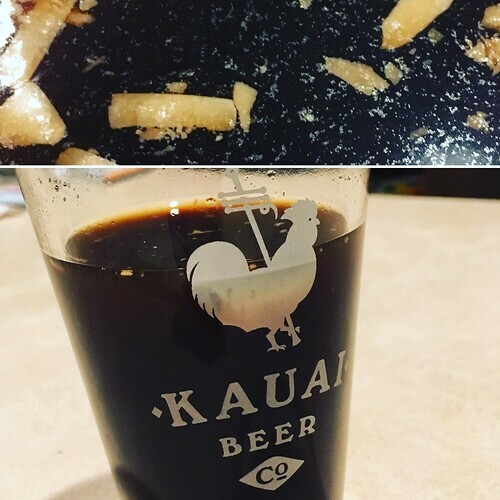 The partial mash (BIAB) recipe for Doors Off (the Kauai Tropical Stout) is as follows. Prepare a 1450 milliliter starter 2-3 days before brew day. Collect 14.63 qt. water and heat to 167°F. Mash in; hold at 156°F for 60 minutes. After starch conversion completes, add dark grains. Mash out by heating to 168°F and holding for 10 minutes. Remove filter bag from water. Squeeze filter bag to extract as much liquid as possible for wort. Pre-boil volume should be approx. 3 gallons. Bring to a boil. Boil for 90 minutes; follow hop schedule described above. Add the turbinado with 15 minutes remaining in the boil. Cool to below 70°F as rapidly as possible; top-off as necessary to reach 5 gallons. 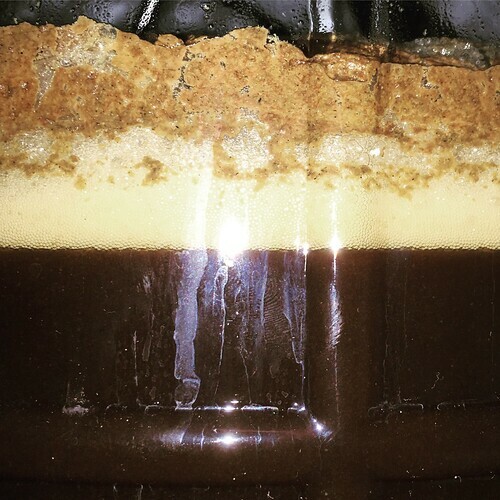 Aerate wort; pitch 2112 yeast. Place in fermentation chamber and ferment at 64°F. After reaching terminal gravity, rack off the yeast cake. Allow to come to room temperature and rest for approx. 7 days. Peel and seed the papaya; chop into small cubes (approx. 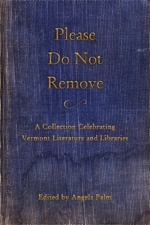 ½”). Consider freezing the papaya to break down the cell walls, but if you do, defrost before adding to bring them to room temperature and avoid shocking the yeast. Pre-heat oven to 350°F and spread coconut in a thin layer on a baking sheet. Toast for 5 minutes; turn coconut and toast 5 more minutes. 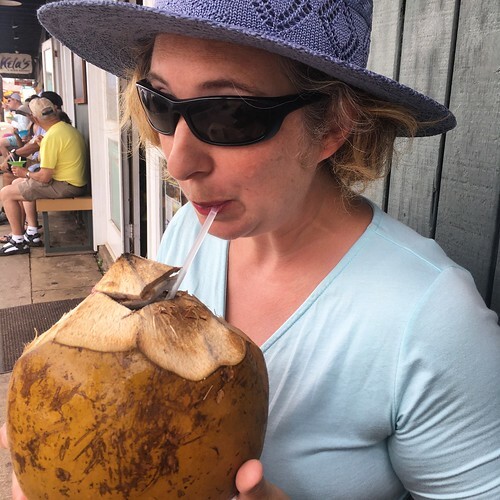 Check the coconut frequently (use your senses!) to make sure it doesn’t burn. Add dry hops and fruit and let condition for another 7 days. 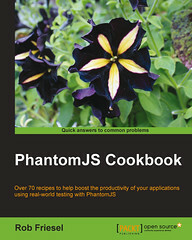 Consider cold crashing for 1-2 days, then package. Use corn sugar to carbonate on bottling day. Rack beer into bottling bucket and bottle. Allow at least 2 weeks to carbonate. 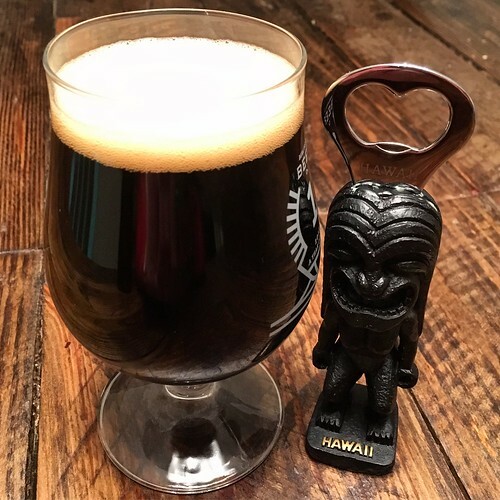 This entry was posted in Homebrewing and tagged Doors Off, homebrew, homebrewing, Kauai Tropical Stout, Tilde Gravitywerks, Tropical Stout. Bookmark the permalink.